A durable ergonomic task stool for workshops, assembly lines, factories, schools, supermarkets, and private homes. 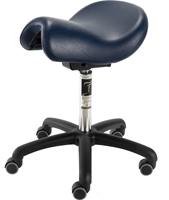 Anatomic sasddle seat is suitable for both men and women. 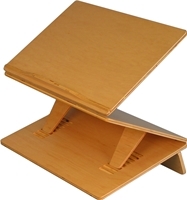 Triple-decker wood writing platform raises up to 18 inches from the desk, for standing or seated reading and paperwork. Relieves neck and back strain for office workers, teachers, students, and writers. 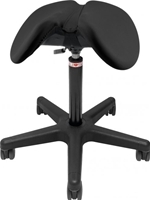 Adjustable angle for personalized comfort. C-quality factory seconds.